Separation anxiety is a common problem, particularly among dogs, and it can be difficult to solve because sorting it out requires intense involvement from the dog owner. However, as a dog owner it is hugely important to solve the problem as soon as possible as separation anxiety is one of the main reasons dogs end up in shelters. Constant barking or howling when you leave the house. Chewing furniture, toys, household items. Jumping through open or closed windows. Chewing at entry points such a window frames and doors. In some cases, the dog may simply be bored but there are many dogs with underlying anxiety issues and they need help. 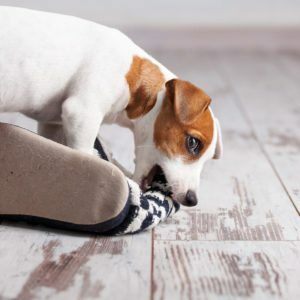 Anxious dogs may chew things because chewing releases pleasurable endorphins into the body, promoting a feeling of calm – just as some humans release tension by biting their nails. Of course it can be distressing to come back to a home that has been damaged by your dog, but try to avoid responding using physical or emotional punishment. These are ineffective and only serve to increase your dog’s anxiety. Leaving your dog’s anxiety issues to resolve themselves not only puts the dog and your family under more stress, it could also cause problems with disturbed neighbours. Genetic: some dog breeds are more inclined towards anxiety. History: dogs that have been abused or have moved homes frequently or been left alone for long periods are more likely to be anxious. Training: dogs that were not properly trained as puppies. Get help as soon as possible. Ask a vet who knows about behavioural issues for advice. He/she will be able to recommend appropriate action or even medical treatment, should it be necessary. Dogs that are going blind or suffering a form of Alzheimer’s also display symptoms of anxiety. Your vet may refer you to a behaviour specialist who will then design a behaviour modification programme for your dog. It is extremely import to get professional help and not to simply rely on ‘self-help’ via the internet. Ensure your dog gets regular and appropriate exercise. Boredom and lack of exercise contributes to anxiety. 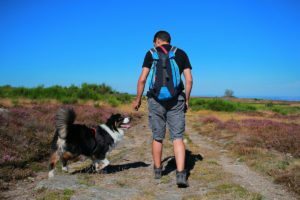 If your dog has been physically exercised and mentally stimulated before you leave, this might increase his ability to cope while you are away. Dogs are also sensitive to changes in their environment. The transition from the energy when you are present to silence in the home when you leave is profound. Leaving lights or the TV on during your absence will help make the transition easier. Start when your dog is a puppy. Leave him/her alone for short periods. Give him plenty of toys or chews to keep him entertained, and a warm, secure place to sleep. When you leave and return, do it calmly and without fuss. Consider adopting another dog as company. However, this won’t always work if your dog already has a serious anxiety issue. If picking up your keys or putting on your coat are triggers for your dog’s anxiety, make sure you pick up and put down or put on at random intervals and not just when you are going out so the dog does not associate them with your leaving.